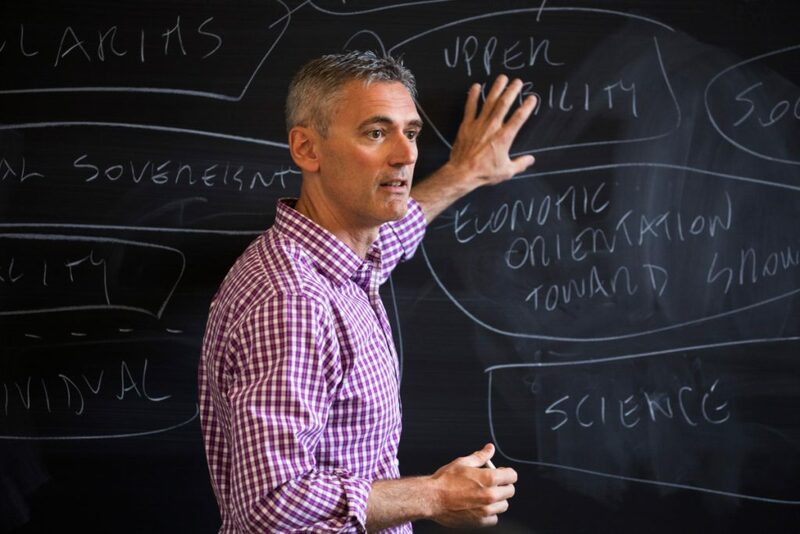 In a new book, the Bates professor explores an apparent contradiction: Americans living in poverty, yet proudly flying the flag. Questions of how class and the economy translate into politics are something plenty of writers over the years have sought to address, from Thomas Frank’s “What’s the Matter With Kansas?” to Arlie Russell Hochschild’s “Strangers in Their Own Land.” The current state of American politics has only magnified this discussion of the overlap of class, poverty and politics: in the 2016 election, the campaigns of Donald Trump and Bernie Sanders tapped into different kinds of populist energy. 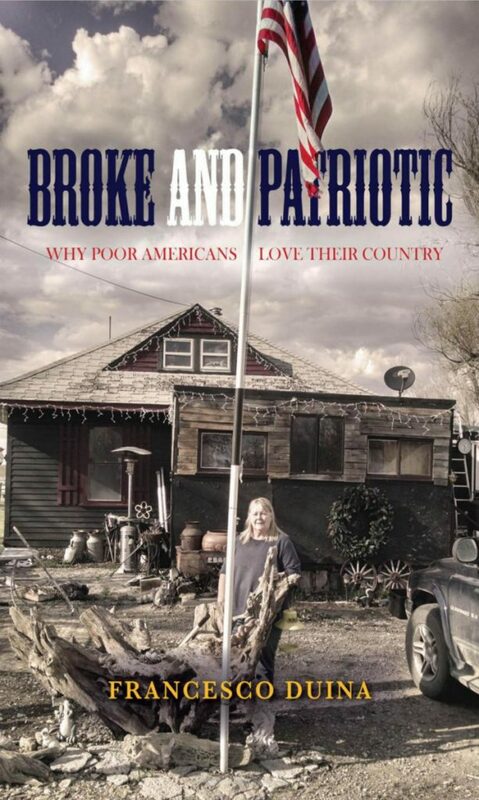 The title of Francesco Duina’s “Broke and Patriotic: Why Poor Americans Love Their Country,” which explores similar questions, suggests the scope of this work. Duina, who teaches at Bates College, spent time in Alabama and Montana speaking with Americans living in poverty and seeking to understand their feelings of patriotism and devotion to their country. The resulting book avoids easy answers, and helps put a human face on some of the most complex issues presently facing the nation. We talked with Duina about his research methods, the way his book overlaps with contemporary politics, and what can be learned from the conversations he had along the way. This interview has been edited for length and clarity. Q: What drew you to the subject of why people who live in poverty are still extremely patriotic? A: Traveling around the country, one sees displays of patriotism: flags outside of houses, the national anthem being played at sports events. You see that a lot even in poor neighborhoods. I thought that it was a puzzle, because in many ways (people with) the least in society could be the most critical of the society that they live in. In many other advanced and developing counties, you don’t see displays of patriotism as you do in the United States in general, and especially among the poor. Data suggests that the poor in many advanced countries are far less patriotic than the poor in America. And poor Americans are generally more patriotic than even wealthier Americans. So there was a puzzle for me: why embrace a country and its values when, one could argue, the country has not done enough for them? If one knows anything about Social Security benefits, class or social mobility, number of hours worked, health insurance – those things look the bleakest in the United States for poor citizens. They’re worse off, in many respects, than the poor elsewhere, and yet they’re the most likely to celebrate their country. Q: How did you decide where to conduct your research? A: I picked two parts of the country that, statistically speaking, one could call the hotbeds of patriotism among the poor. While the poor are patriotic everywhere around the country, there are certain areas where the percentages are even higher. Two of those areas were the South and the Midwest/Northwest corner of the United States: Montana and North Dakota, western Idaho, Wyoming. Once I arrived, in both cases I had arranged for flyers and posters to be put up in libraries and bus stations to let people know that I’d be coming around. Most of my interviews were done while I spent time there, and that meant spending time in laundromats, bus stations, shelters and used clothing stores, starting conversations. And, of course, ensuring that I was speaking to a variety of people: men and women, conservatives and liberals, African-Americans, Latinos and so forth. Q: In the book, you discuss the ways in which both Donald Trump’s and Bernie Sanders’ 2016 campaigns had populist aspects. Did those campaigns have any effect on the people you spoke with? A: I started the process a little before the election cycle. But as I was doing it, the primaries were in full swing. Those two, particularly Trump, came up a lot. I interviewed a variety of people, and the way that that conversation came up was more about Trump’s and Sanders’ dislike and dismissal of the system – that the system and the elite were corrupt and weren’t serving the needs of the people. There was this juxtaposition: they loved the nation, but they disliked the state, and where it was going. Those things resonated, both for people who were familiar with Trump and people who were familiar with Sanders. It also helped me understand the puzzle of it: people love their country, but not necessarily their government. Q: There’s a contradictory element to some of the patriotism that you describe: for instance, some love the country because they believe it connects to their faith, while others admire the fact that it allows for people to have many different belief systems. Can we draw any conclusions from these seeming contradictions? A: I think there are different strands and threads to why poor Americans love their country. When you say “religious freedom,” for some it means that you can be free to worship, or not, whatever you want. For others, it means, “We were founded by Christians running away from persecution in Europe; we’re a Christian country to begin with.” It’s historically somewhat accurate, but it’s a complicated story. The United States isn’t just a single story, and there are contradictions in the history of the United States, with certain people not having civil rights and then gaining those rights. The one thing I tried to do in the book was not to criticize them. They were, in many cases, very sophisticated and well thought out in their beliefs about the country’s history and the idea of the social contract, the idea that it’s the only country that was founded as a set of ideas. Q: Did you discover anything in your research that surprised you? A: I did not expect how important guns were, because of the possibility of hunting. For (my interview subjects), guns equaled generations of ancestors who had used them to feed themselves. This idea of protecting gun ownership with that logic – the American Revolution, the British taking away our guns, and fighting back against the British. That narrative, I was not that familiar with. It was very important to a lot of people, particularly in rural settings. I was surprised by the fervent patriotism that I saw among African-Americans in Alabama. Even older ones, who in many ways were the most convinced of the promise of the United States. In a place where, until a few decades ago, there was official discrimination, segregation – and even now there are challenges – many of those people were the most vocal and hopeful about why this is a great country. The third thing that surprised me quite a bit was the commitment to freedom that they had. They valued physical and mental freedom so much. They’d say, “I’m free to come and go, I’m free to think what I want, I’m free to be homeless when I want to.” One guy who was homeless said that he was on a sabbatical from life. He said, “You can’t do that in other countries.” Which isn’t true, but okay. Q: In your book, you talk about a recent upswing of books covering the working class and people living in poverty. Are there public policy lessons that people can take from your book? A: In the books I was alluding to, like “Hillbilly Elegy” and “Strangers in Their Own Land,” they’re depicting a pretty bleak scenario and mindset among the populations they discuss. I found much more optimism and much more of a sense of ownership for one’s fate. That was a clear theme, a sense that even though the state had not done well, the nation was still promising. There’s still a belief in the uniqueness of the United States and its exceptionalism. I thought there was a reservoir of potential there that, if properly leveraged, could achieve a lot. In other words, these people have not given up yet. They still believe in the dream, and they believe in their own abilities to get out of the situation. Maybe with some help, but on their own terms. From a policy perspective, they’re ready for opportunity. Any policy that would speak to them and is tailored to help them would find a willing people.